You may have seen the hashtag on Twitter, or on Instagram, and wondered what the heck #Dellfie meant. With Dell World coming November 4-6, you might start seeing even more of them show up in your social networks, so it seems like a good time to explore the topic. The #Dellfie is actually not a creation of Dell, although we’ve certainly embraced it. This wasn’t something cooked up by a group of marketers in a conference room looking for the next great "viral" hit. 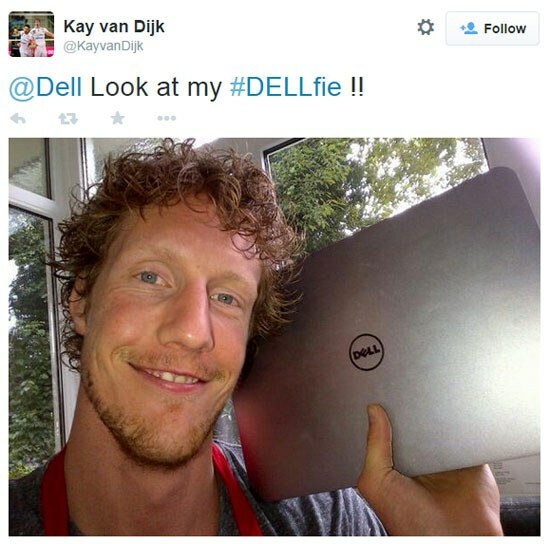 As best I can tell, the first use of that hashtag was by Dutch volleyballplayer Kay van Dijk when he tweeted this photo of himself and his Dell laptop on 29 Jun 2014. I thought it was a really cool idea, so I retweeted it from our @Dell account. 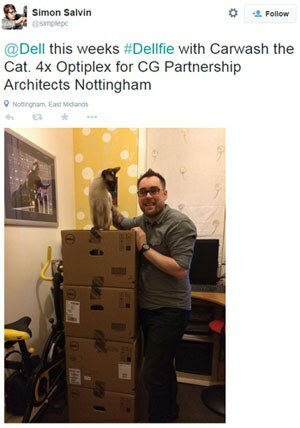 Soon, Simon Salvan of Simple PC, in Nottingham UK, noticed it, added a few #Dellfies of his own, and then tried to blow up the Internet by adding a cat to the mix! Other Dell fans joined in the fun, as well as other Dell accounts and employees. On Twitter, our @DellUniversity team got meta with a photo of two people taking a selfie with a Dell tablet. And our @DellUK team encouraged fans at the Commonwealth Games to share more with cutout signs that put their faces on athletes’ bodies. Our Google+ page celebrated them on Social Media Day. The Dell Military Brand Ambassadors have made tshirts. Our team in Hungary turned it into a Facebook contest; and, the Hacker League (sponsored by Dell) recently did, too! Some of the photos tagged #Dellfie may actually stretched the definition of selfie — which is now officially defined — a bit, though. So, I’ve been asked to clarify what exactly makes something a #Dellfie. It’s pretty simple really. At its purest form, a #Dellfie is a selfie with your Dell. You get the picture. Now go take the picture!